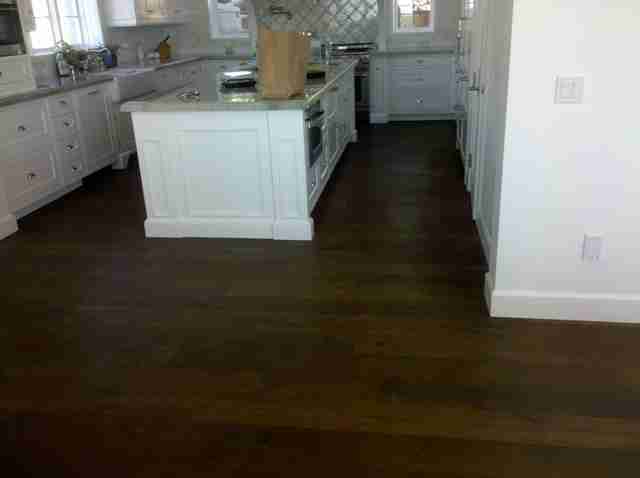 This was a project we worked on for a very nice homeowner who was looking for Wood Floors in Solana Beach. In the process of a major home remodel, the client was referred to us by one of our favorite designers. 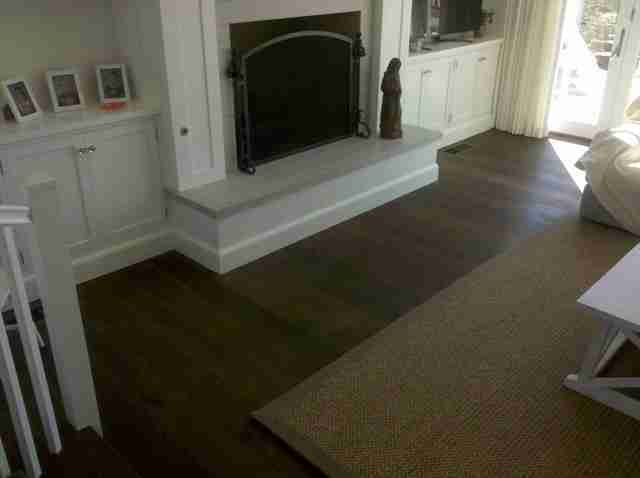 The product selected was a custom made European White Oak. This wire brushed wood floor is stained, with an oil finish which allows the natural beauty of the wood to shine through. It comes 7″ wide, with long lengths, making it stand out from the crowd of average products. This floor was perfect for this fine, custom home. Seen here are a few steps leading into the living room from the entryway. 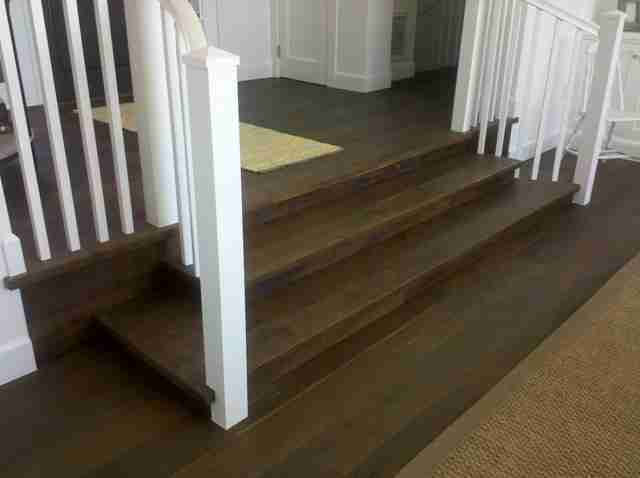 The nosings were custom made as well and every attention to detail given to the installation of the steps. Our installers understand the intricacies involved in stair installation. Here is the living room. The white walls, built-ins, and elegantly simple fireplace are complimented by the warm chocolate brown tones of the flooring. The customer’s existing sisal rug worked beautifully. In the kitchen, you can see again how wonderfully the warm, dark floors work with the white walls and cabinetry. The rich, dark color of the floor serves as a counterpoint to the whites and grays, while the slightly distressed and matte quality of the floor contrast with the smoothness of the counter top, drawer pulls, and back splash. If not for the grocery bag, one might think this a magazine photo! This is a photo of a small sitting area off one of the bedrooms. Because of the oil finish, the floor doesn’t look too shiny or lose it’s visual character when the sun shines through the french doors. This is a very lovely, light filled bedroom. The hardwood floor grounds the room, which feels light and airy. It does so without weighing the space down, but rather adding to the overall inviting quality. Because of the light texturing, the wood has a refined rustic appeal, similar to the bed and side table. This custom floor was an excellent choice for this customer. And we were able to work with the contractor to ensure the job went smoothly. The customer was very happy with the results and even referred his son to us. 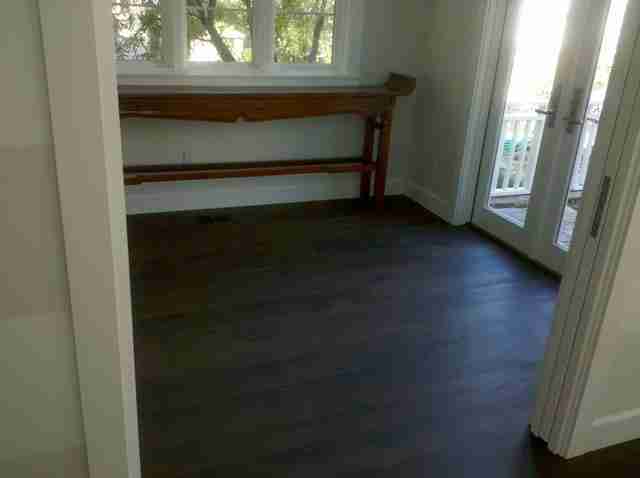 His son liked the floor so much, he selected it for his home as well! 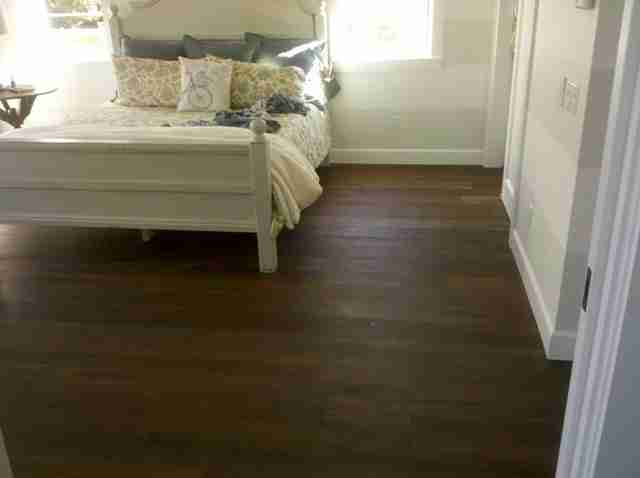 We have several flooring products that could be considered a barn look. I do not specifically have barn wood.